If you want to stay healthy, eating well is essential. Unfortunately, nutritious food doesn’t always come cheap, but there are plenty of smart strategies to help you save money when you shop, and it begins before you even set foot inside the supermarket. A little planning can lead to big savings while ensuring your family is eating a healthy diet. Here’s how to shop smart. Plan a weekly menu for your family and list out the ingredients you will need. This will enable you to know, ahead of time, what you need to buy for the week and ensure you’re not overspending. You can also ensure your main meals contain a healthy mix of food groups and a good variety. • Keep your receipts to review. Simply designate a shoebox for receipts and throw them in there at the end of each day; at the end of the month, go over them. Check to see if items have risen in value, if you are buying items that aren’t getting used, if you can make any adjustments or substitutions, etc. • Make sure your budget is realistic. You need to allow yourself enough money to buy what your family needs. • Look into what tends to get wasted. Cut back on it as wastage indicates you’re buying too much. • Making a list is essential. Use your weekly menu to ascertain what ingredients you’ll need but remember your list needs to cover all meals and snacks as well as household items. 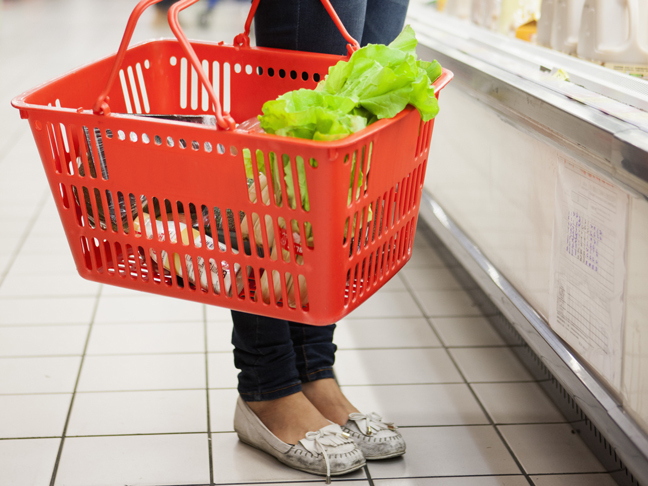 Make a second list for a midweek shop to top up on any fresh ingredients such as bread, fruit, and vegetables, being sure to factor those costs into your budget, too. • Arriving early in a supermarket may be a good way to avoid crowds, but if you brave the throngs and go nearer to the end of the day, you may be able to pick up some discounted items that are reduced to clear. • Consider online grocery shopping, especially if you are prone to grabbing impulse items in store. Online shopping means you are more likely to only buy items on your list. Also, online grocery sites typically run sales and deals—however, do factor in the delivery charges. • Even if you don’t shop online, you can use supermarkets’ websites to make up a basket as if you will check it out (but don’t actually!) to give you a rough idea of how much your items will cost if you’re unsure. This could save you from a nasty surprise at the checkout counter. • Instead of buying everything at the supermarket, consider your local market, as markets are often much cheaper for items such as foreign goods, exotic fruits and organic food (plus, you may be able to haggle!). • Consider using cheaper cuts of meat (e.g. cheeks, hock, shoulder, brisket, etc.). Often you will find there is little difference in taste once meat is cooked into a meal. • Take advantage of reduced-to-clear bins, bear in mind the difference between use by and sell by dates. • Keep special offers in mind but don’t let them tempt you into buying items you don’t need. • Watch for supposed “savings” that don’t actually save you much or anything at all. You may be tempted to buy more than you need and end up wasting food. • Don’t ignore unbranded or own brands; they can be just as good as more expensive items, especially for store cupboard basics (like tinned tomatoes) and you can save a lot of money by switching to basic brands. • Look online for offers and promotional codes, and take advantage of loyalty card offers.